Faizal Bacchus, Lennox Roberts and Kurt Erskine were today committed to stand trial at the High Court for the 2015 murder of businessman Ganesh Ramlall. 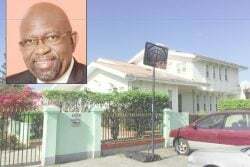 The almost two-year-long Preliminary Inquiry (PI) ended at the Leonora Magistrate’s Court following the pronouncement by presiding magistrate Roshelle Liverpool. Prior to delivering her decision, however, the three defendants were called upon to lead their defence. While Bacchus reserved his right to remain silent, both Roberts and Erskine made unsworn statements from the prisoner’s dock. “I am innocent of this murder and I reserve my defence for the high court,” the men said. Ramlall, also known as ‘Boyo’ was the proprietor of the Regent Multiplex Mall. He was gunned down at his La Jalousie, West Coast Demerara home, around 12.20 am on July 5, 2015 after returning home. Four gunmen pumped seven bullets into him, including one to his head. 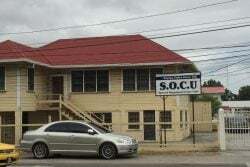 The three men: Bacchus, a taxi driver of 7 Anna Catherina, West Coast Demerara; Roberts of 2279 Tuschen Housing Scheme, East Bank Essequibo and Erskine, a welder/seaman of 285 ‘C’ Golden Grove, East Bank Demerara were charged for the murder.